Each year there is approximately 600,000 knee replacement performed in the United States alone. Unfortunately, thousands of knee replacement lawsuits alleging injuries from defective knee replacements are also filed across the country. Total knee replacements for a number of years has been one of the most successful and life-enhancing surgical procedures available, but for some, the process is not at all what they expected or signed up for. 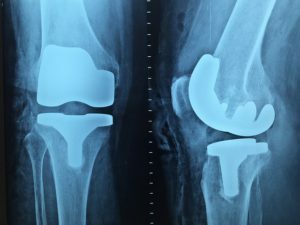 There are thousands of knee replacement lawsuits filed each year that allege injuries from defective knee replacements. While nearly 90% of patients who have the procedure report relief from pain, allowing them to return to a close-to-normal lifestyle, there are 10% of patients who suffer serious, life-altering, and debilitating side effects from faulty products. Knee replacements are usually a last resort after a person has tried medications, corticosteroid injections or other non-invasive forms of treatment. For most, knee replacements become necessary when knee osteoarthritis progresses to a point where a person can no longer walk, climb stairs or even sit without pain. Some of the most recent data concerning knee replacements show that the success rates are extremely high. Most statistics show that if you have a total knee replacement surgery today, there is a 90-95% chance that your implant will last 10 years and an 80-85% chance that it will last up to 20 years. Many reports of early failure related to a lack of bonding and loosening of the tibial baseplate, which can lead to serious pain, bone loss, or muscle damage. The failure of a DePuy Attune knee replacement often requires painful and invasive revision surgery, and some of the damage caused by these defective knee implants may be irreversible. Instability and Loosening: If you’re experiencing instability in your knee when you stand or put weight on it, or your knee is moving backward or sideways in any manner, this may be a sign of a failed knee implant. Persistent Pain: If you’re experiencing constant or persistent throbbing or pain when your knee is in motion, you could be suffering from a failed implant. Warmth or Heat in the Knee: Although this is a normal sensation for a few months following surgery, if warmth or heat in your knee returns, this could be caused by a failed Attune knee implant.When a knee replacement prematurely fails, patients can face painful revision surgery and extensive rehabilitation. Revision surgery is typically more difficult than the initial surgery, especially when bone loss has developed as a result of the implanted device. Why File an Attune Knee Replacement Lawsuit? There are countless medications and devices on the market or that have recently been taken off of the market that has affected the lives of unknowing victims worldwide. The hardest part is getting this information out to these victims. Here you will find a list and all the information you need if you feel that you or a loved one has fallen victim to a defective drug or defective medical devices. Jones Brown Law has worked hard to research some of these current medications and devices out here to give you the most accurate and up-to-date information available. Our Jones Brown Law team has experience helping countless victims of defective drugs and devices. We understand each case is different, however, we will help you recover what you are entitled to and we understand what you are going through when you are dealing with a defective drug lawsuit or a defective medical device lawsuit. Please feel free to fill out our Defective Medical Device Questiuonairre.